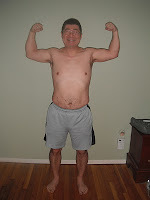 This morning Irene and I weighed ourselves and took our 30 Day pictures which we posted at www.teambeachbody.com/coachnoahlam We both dropped 5 lbs each, making me 190. The lowest in 20 years, and in the best shape of my life. I am looking forward to the next 60 days and continue to see more changes, where my goal is 170 and be able to run an 8 minute mile for a 10k. Then off to the road to speed things up some more. I am so proud of Irene for doing awesome job with the program. It's so great having her as my partner in this game. I started this process to qualify for the Boston Marathon. Today, the Boston Athletic Association lowered the qualifying time for my age group to 3 hours and 20 minutes from 3 hours and 15 mins. That made me focus more and amped up my workout! Also, thanks to Scott and Gail Janicola for being who they are so I can reach my goals!